Generally, when attending a play at Geneseo's Richmond Hill Barn Theatre, it doesn't matter where you sit; the venue's shows are presented theatre-in-the-round-style, and more often than not, Richmond Hill's directors stage their works accordingly, giving audiences a fine view of the action from anywhere in the house. For its production of David Auburn's Proof, however, the theatre's playing area has been transformed into a three-quarter-thrust stage (Proof's front-porch setting designed against the Barn's fourth wall), and at the Friday-night performance I attended, the "best seats in the house," directly facing the set, were already filled by the time I arrived; instead, I took a seat on the stage-left side of the theatre. But for future Proof audiences - and I hope that includes many, many of you - who may find themselves in a similar situation, I'm here to tell you not to sweat the view in the least. As the title character in the Quad City Music Guild's presentation of George M!, Kevin Pieper works his tail off. His Broadway impresario George Cohan belts out number after number, he tap dances, he storms through scenes with natural authority; in this musical-comedy biography, the role of Cohan is practically a show unto himself, and the energy that Pieper gives the part is admirable. More often than not, though, it's energy in a void, because with precious few exceptions, the George M! ensemble isn't giving anything back. At any given time, there are up to 44 performers sharing the stage with Pieper, yet it takes little more than one hand to count the number of them who look pleased to be there. Thursday's preview performance, at least, showed Pieper having to work both the audience and the cast, and that's more responsibility than any single performer should be burdened with. Greek drama is designed to make audiences think and feel, and while I'm not sure I did much of either at the Saturday-night performances in Rock Island's Lincoln Park, I sure did grin a lot. Regardless of style or genre, entertaining theatre has a way of putting audiences in great moods - I've personally smiled through well-staged productions of such varied, inherently tragic shows as Death of a Salesman and A Streetcar Named Desire and Hedda Gabler. And despite their seriousness, Genesius Guild's Seven Against Thebes and Antigone were a terrific time; the shows may not have had the knockabout power you hope for from Greek drama, but they certainly were enjoyable. A half-hour before Friday's performance of On Golden Pond at the Circa '21 Dinner Playhouse, the theatre's producer (and Pond director) Dennis Hitchcock took the stage, and after making the traditional opening-night welcomes, warned that the show's first act alone ran nearly 80 minutes - a long haul, he explained, for elder audiences. Yet I'm thinking that Hitchcock's announcement was made less out of concern for the crowd's bladders than out of justifiable pride - a trek to the restroom would force people to miss parts of the show, and with the stunningly fine performance Michael Kennedy is giving here, who would want to miss even one? In the second act of the magnificent musical parody Urinetown, the character of Bobby Strong - a novice revolutionary, and the show's ostensible leading man - sings "Run, Freedom, Run," a rousing call-to-arms to his fellow oppressed. The number, a sort of "Sit Down, You're Rockin' the Boat" from Guys & Dolls as seen through a Les Miserables filter, is one of those guaranteed show-stoppers designed to leave audiences cheering. At the Timber Lake Playhouse's Saturday-night performance of the show, however, this production number led to something even more thrilling. A theatre company takes a risk when it changes key elements of Shakespeare, as Iowa City's Riverside Theatre has by switching the protagonist in its presentation of The Tempest from Prospero to Prospera. 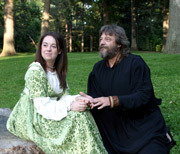 Turning this male character into a female brings an entirely new dynamic to the performance, yet even though this makes for a unique production, it distracts from the tone of Shakespeare's text. The Tempest is one of Shakespeare's most magical offerings - a wildly theatrical concoction set on an enchanted isle populated by fairies, sprites, and spirits, and governed by a benevolent (yet easily enraged) ruler in possession of a supernatural cloak. Given the built-in limitations in budget and production design at Rock Island's Lincoln Park, though, no one attending Genesius Guild's current production of the play should expect to be wowed by spectacle; Ariel, for instance, won't be flying in on any invisible wires. Yet from its first scene, this Tempest is graced by spectacle of a different variety: the sort of stage alchemy that occurs when fine performers tear into rich material, and when a strong director orchestrates the actors' contributions and stage pictures with inventiveness and grace. Imagination, of course, is its own kind of magic. So I'm not exactly fit to comment on how successfully Christie's murderous plot plays itself out here. Yet my familiarity with the story didn't lessen my enjoyment of CAST's endeavor in the slightest. Quite the contrary: I loved this production, because the vigor with which the Mousetrap ensemble played their comically shady characters was positively exhilarating. The morning after attending the Timber Lake Playhouse's production of the romantic comedy The Philadelphia Story, I drove to my local video store and rented the DVD of the beloved 1940 film, which I had never seen. I would love to report that Timber Lake's production put me in such a happy state that I was simply eager to re-live the stage experience. But unfortunately, the rental was more of a necessity than an indulgence; I had to see what about Philip Barry's play made the movie such a treasure, because its reputed charms, sadly, weren't at all apparent on the Mt. Carroll stage.